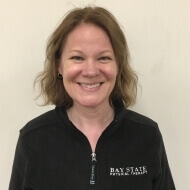 Mary graduated with her Doctor of Physical Therapy from MGH’s Institute of Health Professions in 2016 and is an active member of the APTA, MA Chapter and Orthopedics Section. Her clinical experience includes a variety of inpatient and outpatient settings working with a variety of orthopedic and neurologic impairments. Mary’s particular interests are in conditions of the spine and chronic pain conditions. A native of the South Shore, Mary enjoys spending free time with family, hiking, tap dancing and working on home improvement projects.